Just when I begin to think I have a handle on how to approach the assignment of making artwork that responds to the task set by the Challenge Master, the next puzzle appears and I face the same conundrum: how to interpret it. The weekly responses are really helpful because they are totally different from one another and often very different from what I have been thinking about. Betty focused on horizons, Martha on lines. At first, when I read Hsin-Chen's challenge, my mind leapt immediately to its usual default: literal and representational. I researched "horizon" and found the expected references to horizon in Astronomy, Geology, Archaeology, and of course, the intersection of earth and sky. This line of thinking brought to mind some small landscapes I have made to teach students how to portray sky and earth on fabric using paintstiks. They certainly satisfy the definition of where the earth meets the sky, and perhaps it is the perspective provided by the horizon line in landscape art that is so compelling to viewers: what is just beyond that far hill? The depth beckons to us and invites us to step into the picture. But I read on and one definition of 'horizon' intrigued me: "the range of one's knowledge, experience, or interest; the scope of a person's education, understanding, etc. : His horizons were narrow." And I was delighted to read a little further: "Synonyms: world, perspective, domain, viewpoint." How fitting for our group! I mulled this over, and in subsequent discussions with wonderful artist friends of mine (a shout-out to Nysha, Linda B, and Pat C), I realized that the reference 'delicate lines carry emotions and expressions' permitted me to interpret them as the lines that appear on a face over time ... and that life presents us all with horizons all the time; some approach them boldly and with confidence and some regard those horizons as limits. So it would not be unreasonable of me to select a portrait to depict my response. Or, in the interest of "expanding my horizons," I have given some thought to this confirmed machine individual using hand-stitched 'lines' of thread to sketch an image. I have some sashiko threads and gorgeous heavy cotton I brought back from Tokyo and this would be a perfect excuse to use them. And that sums up the reason being in this group is so great for me: with each successive challenge, I can use whatever interpretation I want to in response, and am not restricted to particular materials or techniques. This kind of openness is both daunting and emancipating. I leave for Taiwan in three weeks to teach at the Taiwan International Quilt Exhibition - so I don't have time to dally! Looking forward to hearing what others are thinking about as they face this challenge. The magic of thread brings us thinking space where is as great as universe. The definition will be different as people’s thinking. 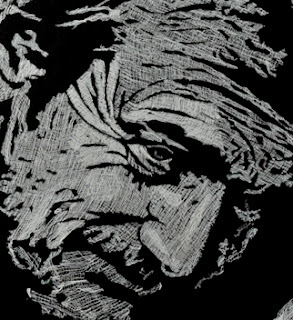 You are much welcome to exchange your creative ideas with quilters face to face at TIQE 2012.